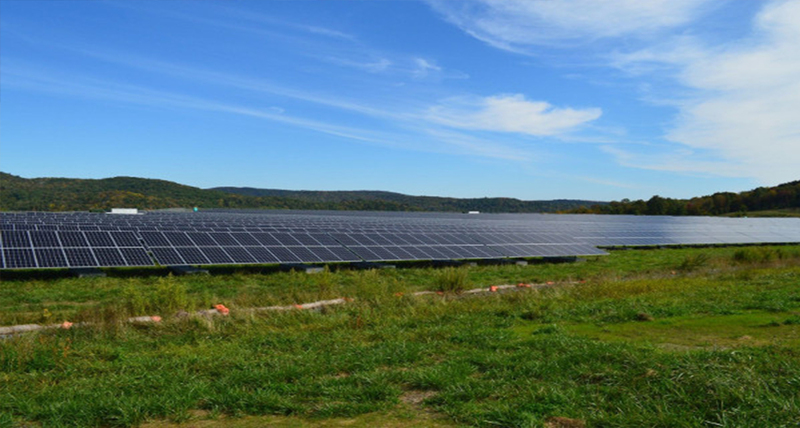 Conti Solar played an integral role in turning a historic Superfund site into another renewable energy success story. The Elizabeth Mine Site, one of the largest intact historic mining sites in New England, operated for over 100 years producing over 50,000 tons of copper. After the mine closed in 1957, associated mine waste remained, and its acidity and metals posed a threat to the area’s water and eco systems. In 2001, The EPA placed Elizabeth Mine on the National Priorities list, designating the area as a “Superfund” site requiring remediation. In 2010, engineering firms began the massive site clean-up effort. Shortly thereafter, in 2011, Wolf Energy and Brightfields Development approached the EPA about the potential of installing a distributed generation solar farm on the site. In 2015, Greenwood Energy came on board to provide additional assistance. Based on successful partnership in past projects, Greenwood hired Conti Solar to manage the final design and construction work. The installation posed technical challenges requiring expertise and sound execution, as the solar arrays needed to be constructed on top of the environmental cap. To ensure safe and successful transportation of materials, Conti graded and graveled stretches of road to ensure that the trucks with Solar Flex Rack’s pre-cast ballast system could reach the site. On August 20th, Conti completed construction on the project. Expected to commence commercial operation in October of 2017, the Elizabeth Mine Project will generate enough electricity to power over 1,200 homes.